Even though our first day aboard Hoku Lele (Shooting Star in Hawaiian) had been exhausting, with crew arriving tired from red-eye flights and an eventful dinner and Tahitian feast that night, everyone was up bright and early, ready for the next day of adventuring. Slipping the mooring early, we eased our way out into the channel, around a point from Apu Baie to Baie Hurepiti, with its very narrow channel, limited navigation markings and coral reefs. Once again, mostly navigating by the water color and with the help of Noah Plantier, our Vanilla Tour host, who stood on his dock and directed us to the correct mooring, we made a successful transit! 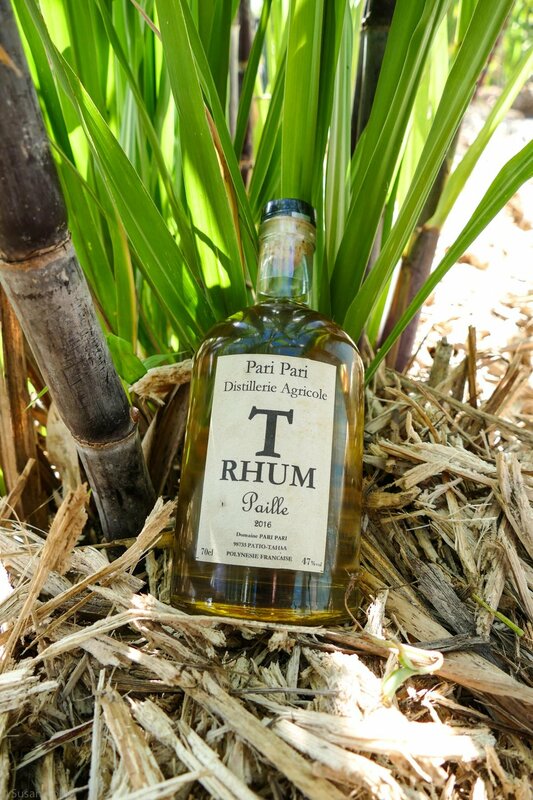 What was billed as a half-day tour with a vanilla farm visit, a craft distillery visit and various viewing stops around the island of Taha'a, turned into a full day event! Noah, a charming young Frenchman who has taken over the business from his dad Alain, first walked us through the gardens created on the shore. So knowledgeable, he talked about the medicinal qualities of so many of the plants and how a lot of them were brought to the islands by adventurers and explorers of the past. Although he trained as an aerospace engineer in France, his understanding to the islands is vast and he is so happy sharing it with his guests. We piled into the safari jeep, with its water cooler decorated with hibiscus flowers, seven in the back and one riding shotgun with Noah. The island roads are narrow and winding, offering amazing views onto bays with brilliant clear waters or onto fields of taro growing in the moist soil. Sometimes we were in the middle of dense jungle that is trying its best to take back the roads. Under Noah's watchful eye, Jane trying her hand at fertilizing a vanilla orchid flower. 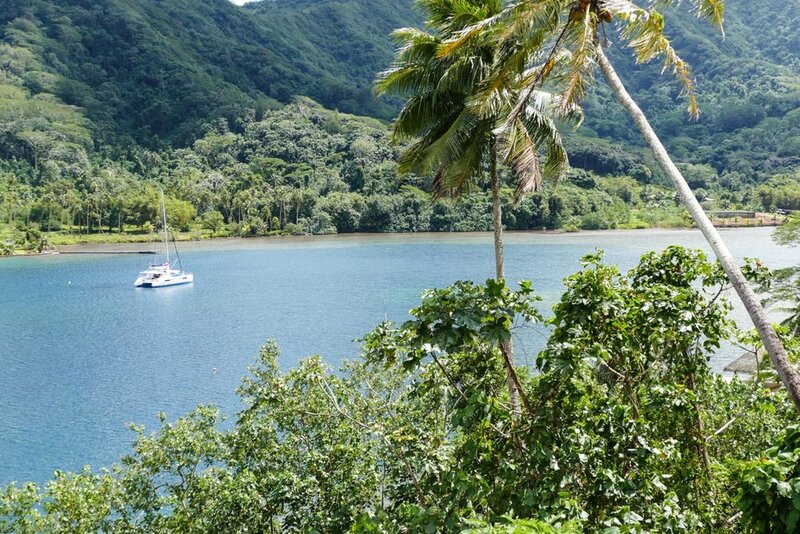 Our first stop, after hopping out to take a picture of Hoku Lele laying peacefully on the mooring on Baie Hurepiti, with the shallow coral areas clearly visible from high up, was the vanilla farm. Walking down the road, we passed one of the ubiquitous bread boxes where the daily baguette is delivered! Clambering up into the plantation, we were surrounded by the fragrant vanilla orchid plants, some with flowers, some with long clusters of vanilla beans maturing and others with their flowers covered with plastic bags. The vanilla industry is big in these islands and the growing and harvesting is done differently from elsewhere in the world. As there are no specific native bees to pollinate the flowers, each one is artificially pollinated by hand, a meticulous and time-consuming practice. And even after the mature pods are picked, each day they are laid out in the sun, turned, massaged and returned to a dry spot at night. It's no wonder that vanilla is expensive! Noah's family had previously operated a vanilla farm, but a few years ago, a blight hit the island which wiped out many of the farms, including theirs. For our tour, he took us to a neighbor's plantation, where he showed us the pollinating process. Several of our group tried their hand at it, with some success but we all agreed on the skill level required to make the process viable was way beyond what they managed! By this time, we were all getting hungry so we stopped at - get this - a pizza joint on the side of the road, ordered what turned out to be delicious pizzas and went on to Pari Pari Distillerie. After picking up our pizza, we continued on around the island, stopping periodically to view various plants and sights, and at the little, local grocery store to stock up on toilet paper and other necessities! Like the local coconut bread Noah raved about and of course, another baguette! Noah is a wealth of knowledge and on one stop, he hops out of the truck, walks across the road and picks a fern leaf growing from a steep bank. He carefully takes one frond, places it on Betsy's arm and smacks it! When he carefully lifted the fern, there was perfect white "tattoo" from the spores on the underside of the frond! We all ended up with these lovely patterns on our arms and faces. On another occasion, he pulled over, picked leaves of the wild hibiscus and showed us how they're tied together to make the blankets that cover the food while it cooks in the fire pits. By this time, our half-day was well into a full day. The final stop was at the top of Mt. Haporauta where Noah presented us with a lovely picnic of fresh star fruit and pampelmoes (grapefruit) and proceeded to chop the tops off fresh coconuts for delicious, fresh and refreshing coconut water, that we sipped through bamboo straws that his dad had made that morning. Back at base, we met Noah's dad Alain who had a lovely fruit punch waiting for us. Apparently, according to the people at the Moorings base, a lot of the charterers don't want to spend as much time ashore as we did, or even just a half-day tour. All I can say is, they are really missing out learning about the islands and experiencing them from another aspect. Especially with Noah, who is such a pleasure to have as a guide. On returning to the boat, we enjoyed an early dinner, heading to bed for a good night's sleep in preparation for another busy day.